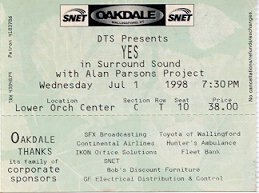 It didn't seem right, not having to drive at least two hours to a Yes concert. After the short half-hour ride, I was there already. Yes did not disappoint. It's obvious that as the tour has moved along, they have hit their stride. The few new additions to the set have been played better and better each time. The set was exactly the same as the last two shows. The theatre was an indoor theatre with outside picnic areas. It was different seeing them indoor, when the previous two shows they played were in a tent, and on a ski resort. 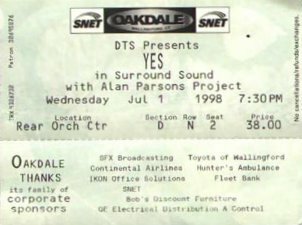 Before "And You And I" Jon commented that he received a card from someone in the audience who had seen the band 25 or so years ago and is now taking his children to this concert. He said that his kid would be up in his room playing this song. "And You And I" is always a highlight of the show, as far as the crowd is concerned. I know some of us diehards have seen it done to death, but the masses seem to love it. "Heart Of The Sunrise" is another favorite, and the band really enjoys playing that one. They nailed the harmonies in "Close To The Edge" again. They've played that song so well of late, I don't even remember how bad it was in Toronto at the start of tour. Igor really shines on this song. He plays the solo at the end, note for note like Rick, until the very end, when he adds his own style to it. He continues to impress me each time I see him play. The last four songs on the set are the "danceable" songs, "America," "I've Seen All Good People," "Owner Of A Lonely Heart," and "Roundabout." The audience is really into those. Some little observations: Alan's drum set has a built in cup holder. That's a nice feature. Jon and Igor continue to add dimension to many of the songs with their percussion work. Chris didn't jump nearly as high during his solo as he has the last few times around. Well, this is my last show, probably until the next tour. I'd like to thank all the people I've met and talked to over the last week for all their help and the many great Yes related conversations we've had. 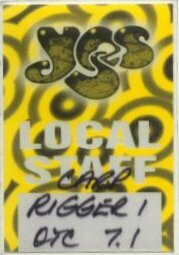 Mike, Eddie P, Frank, Krista, John, Mark, John K, Craig, Wendy, Ed R, the guy in Boston who gave me directions, John A, Peter Banks, Geoff Downes, Alan White, Steve Howe, Billy Sherwood, Chris Squire, Igor Khoroshev, and anyone else who I forgot or I don't know their names. Thanks a lot, and hopefully I'll see all of you again next tour! Just got back from the show in Wallingford, CT. These guys just never cease to amaze me. 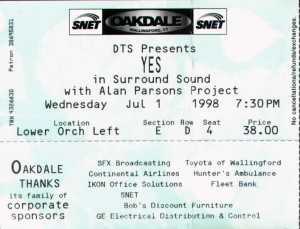 I don't care what incarnation of Yes is together I'd see them again anytime. 2nd show on this tour that I've seen, that Igor Khoroshev is simply amazing. Truly a worthy successor to the great Rick Wakeman. 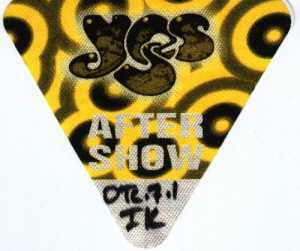 I hate to disagree with all the "trooper" vs. "Yes west" people, but I always enjoyed Yes equally with any lineup. I wanted so badly at first to hate Trevor Rabin, but he was and is absolutely amazingly talented. Some of Yes best moments came from him. Union might not have been the greatest album, but what a tour, having all of them together was so sweet. Steve, Jon, Chris, Igor, Alan, and Billy if you are following this stuff at all, thanks for yet another fabulous night.